Net Weight: Packet (200 seeds)1oz (1600)(+$6)1/4lb (6400)(+$9)1/2lb (12800) (+$14)1lb (25600) (+$17) This item is currently out of stock! There is evidence of beets being grown for their greens and roots as early as 2000 BC by the Celts in northern Europe. 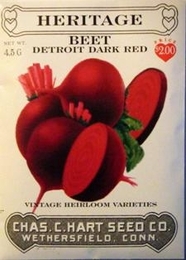 Known as 'Blood turnips' in colonial days, Detroit Dark Red was introduced in 1892 to gardeners and is still considered one of the best beets to grow for taste and keeping quality. Detroit Dark Red Beet is a choice late variety, the tops making small upright growth, allowing planting in close rows, important where space is limited. Plant seed outdoors as soon as the ground can be prepared. Plant in rows 12 inches apart spacing seeds 1 inch apart. Can also be broadcast in beds. Cover seed with 1/2 inches of fines soil, well pressed down. Keep moist until seeds sprout. When plants are 3-4 inches apart. Can be planted until August. 1,600 Seeds/oz. Plant 1oz per 100ft row, 10lbs of beet seed needed per acre.